Tylenol is a brand of drug advertised for relieving pain, reducing fever, and relieving the symptoms of allergies, cold, cough, and flu. Drug, broadly defined, is a term used for any chemical substance that when introduced to the body of a living organism has a non-food impact in altering the organism's normal functioning or structure. The term drug lacks a precise definition and may used in different senses in medicine, pharmacology, government regulation, and common usage. The term may have a positive connotation as a chemical compound used medically in humans or animals for diagnosis, treatment, cure, mitigation, or prevention of disease, pain, or other abnormal condition. It also may have a negative connotation as a substance that affects the body or mind of humans in such a way that it implies impairment, abuse, addiction, or illegal use. Some drugs are used to create or enhance recreational experience (recreational drugs) and some are used in religious, shamanic, or spiritual contexts (entheogens). Many chemical agents known as drugs are used both medically and for non-therapeutic purposes, such as anabolic steroids used in treatment of cancer or recovery from surgery, as well as used (generally illegally) to gain a competitive advantage by enhancing athletic performance. 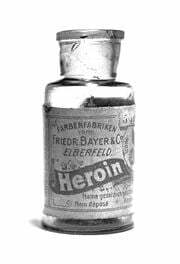 Morphine may be used medically as an analgesic but also is highly addictive, with among the highest abuse and dependency potential of all known drugs. 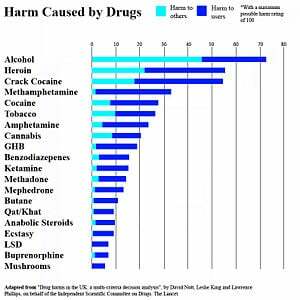 Among drugs with common, often legal non-medical use as recreational drugs are alcohol, caffeine, and tobacco. 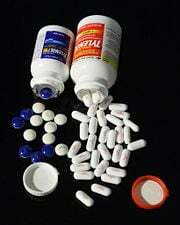 Common drugs used in medicine are antipyretics (for reducing fever), analgesics (for reducing pain), and antibiotics (inhibiting germ growth). Human creativity, interacting with the natural environment, has been able to identify, produce, and synthesize many drugs of medical significance, such as aspirin and quinine, traced to the the bark of the willow and cinchona trees, respectively, and penicillin, traced to a fungi. However, many drugs have been tied to abuse, resulting in physical, social, and psychological harm, and the illegal drug trade has been linked to violent crime and other societal harms. 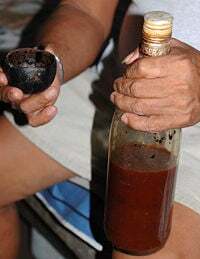 The term drug is thought to originate from the fourteenth century Old French "drogue" ("supply, stock, provision") possibly deriving from the Middle Dutch or Middle Low German word "droge-vate" ("dry barrels") or "droge waere" ("dry wares"), referring to medicinal plants preserved in barrels or that medicines mainly consisted of dried herbs. (3) "in common usage, the term often refers specifically to psychoactive drugs, and often, even more specifically, to illicit drugs, of which there is non-medical use in addition to any medical use." (D) articles intended for use as a component of any article specified in clause (A), (B), or (C). Consistent with that definition, the U.S. separately defines narcotic drugs and controlled substances, which may include non-drugs, and explicitly excludes tobacco and alcoholic beverages. Many natural substances, such as beers, wines, and psychoactive mushrooms, blur the line between food and recreational drugs, as when ingested they also can have nutritive value. Penicillin core structure. Penicillin is a group of antibiotics derived from Penicillium fungi. Coffee is the most widely used psychoactive drug beverage in the world. Nonsteroidal anti-inflammatory drugs (NSAIDs or NAIDs). Family of medications, including aspirin and ibuprofen, that have analgesic and antipyretic effects, as well as anti-inflammatory effects in higher doses, and which a non-narcotic and nonsteroidal. Analgesics. Any member of the group of drugs used to relieve pain. Antipyretics. Drugs or herbs that reduce fever. Anesthetics. Drugs that cause anesthesia: reversible loss of sensation. Antiviral drugs. Those that combat illnesses caused by viruses. Antibiotics or antibacterial. Those chemicals that kill or prevent the growth of bacteria; antibiotics, however, has come to be used for a broader range of drugs that includes antifungal impacts on yeasts and molds..
Antimicrobrial drugs. Those, such as penicillin, that kill or prevent the growth of microorganisms such as bacteria, fungi, or protozoans. Antiseptic drugs. Those that kill or prevent the growth of microorganisms in the oral cavity. Over-the-counter drugs. Those medicines that may be sold directly to a consumer without a prescription from a healthcare professional. Prescription drugs. Those medicines that may be sold only to consumers possessing a valid prescription. Psychoactive drugs or psychotropics. Chemical substances that cross the blood–brain barrier and acts primarily upon the central nervous system where it affects brain function, resulting in changes in perception, mood, consciousness, cognition, and behavior. Recreational drugs. A type of drug, usually psychoactive, that is used with the intention of creating or enhancing recreational experience. Aspirin is a drug commonly used as an analgesic, antipyretic, and anti-inflammatory and in low-doses to prevent heart attacks. A medicine or medication is a drug taken to cure, treat, mitigate, or diagnosis an illness or medical condition, or may be used as preventive medicine that has future benefits but does not treat any existing or pre-existing diseases or symptoms. Dispensing of medication is often regulated by governments into three categories: over-the-counter (OTC) medications, which are available in pharmacies and supermarkets without special restrictions; behind-the-counter (BTC), which are dispensed by a pharmacist without needing a doctor's prescription; and Prescription only medicines (POM), which must be prescribed by a licensed medical professional, usually a physician. Drugs have been employed for spiritual and religious use since antiquity. Entheogens is the term used for psychoactive substances when they are used for their religious or spiritual effects, whether or not in a formal religious or traditional structure. Entheogens are mostly hallucinogens, being either psychedelics or deliriants, but some are also stimulants and sedatives. Historically, entheogens were mostly derived from plant sources and have been used in a variety of traditional religious contexts. With the advent of organic chemistry, there now exist many synthetic substances with similar psychoactive properties, many derived from these plants. Examples of traditional entheogens include: kykeon, ambrosia, iboga, soma, peyote, bufotenine, ayahuasca, and Datura. Other traditional entheogens include cannabis, ethanol, ergine, psilocybe mushrooms, and opium. Many pure active compounds with psychoactive properties have been isolated from organisms and chemically synthesized, including mescaline, psilocin/psilocybin, DMT, salvinorin A, ibogaine, and scopolamine. Semi-synthetic (e.g. LSD derived from LSA) and synthetic substances (e.g. DPT used by the Temple of the True Inner Light and 2C-B used by the Sangoma) have also been developed. Entheogens may be compounded through the work of a shaman or apothecary in a tea, admixture, or potion like ayahuasca or bhang. Nootropics, also commonly referred to as "smart drugs," are drugs that are claimed to improve human cognitive abilities. Nootropics are used to improve memory, concentration, thought, mood, learning, and many other things. Some nootropics are now beginning to be used to treat certain diseases such as attention-deficit hyperactivity disorder, Parkinson's disease, and Alzheimer's disease. They are also commonly used to regain brain function lost during aging. Racetems (eg. Piracetam, Oxiracetem, levetiracetam ) are considered to be a class of nootropics. Similarly, drugs such as anabolic steroids improve human physical capabilities and are sometimes used (legally or not) for this purpose, often by professional athletes. Stimulants are often seen as smart drugs, but may be more accurately termed productivity enhancers. Some stimulants can enhance cognition and memory in some people, but cause psychosis in others. They generally have a very substantial side-effect profile and are not considered classical "nootropic" drugs. These typically improve concentration and a few areas of cognitive performance, but only while the drug is still in the blood. 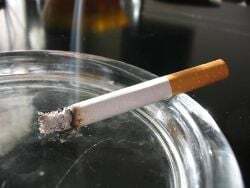 The cigarette is the common pharmaceutical form of tobacco: one of the world’s best selling drugs. Recreational drug use is the use of a drug, usually psychoactive, with the intention of creating or enhancing recreational experience. Such use is controversial, however, often being considered to be also drug abuse, and it is often illegal. Also, it may overlap with other uses, such as medicinal (including self medication), performance enhancement, and entheogenic (spiritual). Drugs commonly considered capable of recreational use include alcohol, tobacco, and drugs within the scope of the United Nations Single Convention on Narcotic Drugs and Convention on Psychotropic Substances. The fact that caffeine use may be considered recreational is often overlooked. caffeine (from coffee, tea, and other plant sources): Legal in all parts of the world. cannabis (commonly known as marijuana; contains cannabinoids, primarily tetrahydrocannabinol (THC)): Illegal in most parts of the world. ethanol (commonly referred to as (ethyl) alcohol, produced through fermentation by yeast in alcoholic beverages such as wine and beer): Legal but regulated in most parts of the world, and illegal in several countries. tobacco (contains nicotine and beta-carboline alkaloids): Legal but regulated in most parts of the world. opiates and opioids: Generally legal by prescription only, for relief of pain. These drugs include hydrocodone, oxycodone, morphine, and others; some opiates are illegal in some countries but used for medical purposes in others, such as diacetylmorphine (heroin). 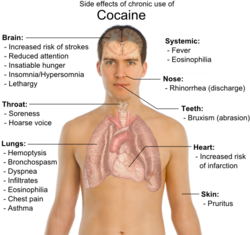 cocaine (A stimulant derived from the coca plant): illegal in most parts of the world, but derivatives such as lidocaine and novocaine are used in medicine and dentistry for local anesthesia. Legal drugs are not necessarily safer. A study in 2010 asked drug-harm experts to rank various illegal and legal drugs. Alcohol was considered to be the most dangerous. Drug abuse or substance abuse refers to a maladaptive pattern of use of a substance that is not considered dependent. The term "drug abuse" does not exclude dependency, but is otherwise used in a similar manner in nonmedical contexts. The terms have a huge range of definitions related to taking a psychoactive drug or performance enhancing drug for a non-therapeutic or non-medical effect. All of these definitions imply a negative judgment of the drug use in question. Some of the drugs most often associated with this term include alcohol, amphetamines, barbiturates, benzodiazepines (particularly temazepam, nimetazepam, and flunitrazepam), cocaine, methaqualone, and opioids. Use of these drugs may lead to criminal penalty in addition to possible physical, social, and psychological harm, both strongly depending on local jurisdiction. Definitions of drug abuse general fall into four main categories: public health definitions, mass communication and vernacular usage, medical definitions, and political and criminal justice definitions. Drugs, both medicinal and recreational, can be administered in a number of ways. Many drugs can be administered in a variety of ways rather than just one. Injected as a solution, suspension, or emulsion either: intramuscular, intravenous, intraperitoneal, intraosseous. ↑ Douglas Harper, "drug," Online Etymology Dictionary. Retrieved March 1, 2019. ↑ World Health Organization, Lexicon of Alcohol and Drug Terms (Geneva: World Health Organization, 1994, ISBN 9241544686). Retrieved March 1, 2019. ↑ U.S. Food and Drug Administration, Federal Food, Drug, and Cosmetic Act (FD&C Act): SEC. 201. Title 21 §321. Definitions; generally. Retrieved March 1, 2019. ↑ 21 U.S. Code § 802. Definitions Legal Information Institute. Retrieved March 1, 2019. ↑ Medicines and Healthcare Products Regulatory Agency (MHRA), Pharmacy medicines Medicines: reclassify your product, January 22, 2019. Retrieved March 1, 2019. ↑ D. M. Anderson, et al, Mosby's Medical, Nursing, & Allied Health Dictionary, 6th edition. (St. Louis: Mosby, 2002) ISBN 0323014305. DrugBank, a database of over 12,000 drugs. This page was last modified on 1 March 2019, at 23:16.